We’re going to hit the same issue here that we did with Codenames and Codenames Pictures. While Kingdomino and Queendomino are not the same game, they do share so much in terms of aesthetics and design that we’ve already sort of covered the accessibility of the latter. You can just look at our teardown of Kingdomino and extrapolate. So assured are we of this observation that it exactly what we’re going to do here. Large chunks of this teardown are going to be identical to Queendomino‘s younger sibling. However, the economical elements of taxation and towers does change the profile somewhat, so what we’ll mostly focus on here is where we differ from the Kingdomino teardown. I’ll be advising liberally to look to the Kingdomino teardown for full discussions of a lot of this. As with Kingdomino, there are some issues with the palette but these colours are usually accompanied with art that is (mostly) distinctive. For some categories of colour blindness, the town and grassland tiles might be too similar in silhouette to be easily differentiated at a distance. As with Kingdomino close inspection will be enough to tell tiles apart even without support from the table. In that respect it’s a little worse, but not dramatically so. However, the larger problem is that the small size of the market tiles and the fact they often map to terrain can make certain things much more difficult to make out without help. 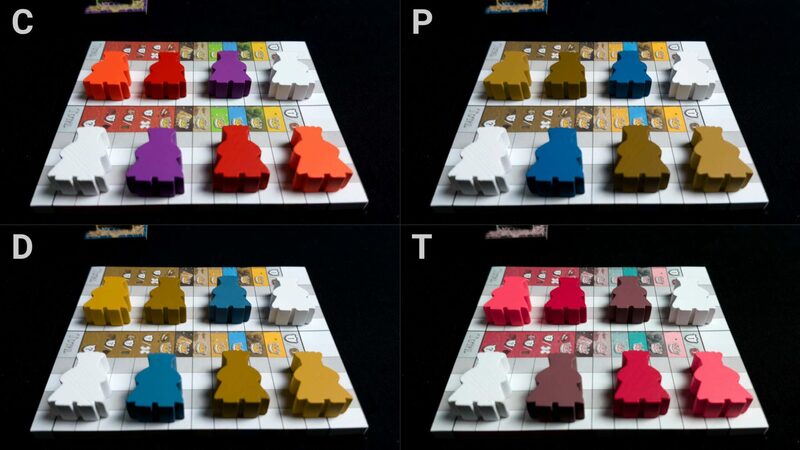 There is though a welcome improvement in the palette for the meeples you use, although not enough to fully solve the issues we saw in the original. Rather than green, pink, blue and yellow here we have white, purple, red and orange. The latter two are an unfortunate choice but the rest offer much better discrimination. The improvements and deteriorations basically average out to ‘every so slightly worse’, but not to the point the game is obviously less playable. As with Kingdomino, we’ll recommend it in this category. Refer to the Kingdomino accessibility teardown for a full discussion of this. The new issues introduced by Queendomino here relate mainly to the marketplace. This makes use of two-sided tiles which can be relatively information dense and this might be difficult to make out at a distance and even under close inspection with an assistive aid. The ‘face down’ side of the tile includes a graphical icon, information regarding knights and towers to be collected, victory points and special terrain enhancements. Close inspection of these is going to be necessary for most players even under ideal circumstances, and especially so if visual impairments must be taken into account. One of the options everyone has on their turn is to invoke the dragon to burn down a tile. It can only be done once per round, but there’s nothing quite like someone examining a tile with intense interest to suggest to someone else that maybe they want to spend the coin necessary to remove that tile from play. If close examination is being done on someone’s turn then there’s no time for that to happen before they buy or not. A common compensation for visual impairment though is to examine the game state when no decisions are needed so as to prepare for when they are. This is a point of tension in the design that has a substantive impact on this section. A second issue relates to placed town buildings, because these may be threaded erratically through someone’s queendom and thus it can be difficult to ascertain what bonuses and scoring opportunities other people may have. There are likely to be a fair number of these across several different play areas and understanding this is key to knowing when you might want to burn a building or claim a tile you might not otherwise want for yourself. Within Kingdomino all you need to know is how many crowns and how large the contiguous sections are. Queendomino needs you to know a fair amount of extra context to make fully informed decisions. We’ll tentatively recommend Queendomino in this category. The extra complexity introduced by the knights, towers and marketplaces substantially increases the cognitive cost of play. The needs for numeracy increase considerably over the already relatively high expectations in Kingdomino itself. Knowing when a town and building combination outscores (or will outscore in the future) a more generic tile choice is not necessarily straightforward. It will be driven by the context of your own terrain as well as the opportunities and bonuses other people have put in place. Both strategic and tactical decision-making skills are stressed more heavily in Queendomino. Some scoring rules are only going to come into effect for players that have planned and picked for them, whereas some (the queen for example) can be snatched away at the last moment leading to unexpected upsets in position. Most of the accessibility score in this section for Kingdomino came from the possibility of playing collaboratively, and that’s still possible here but it’s not quite as easy given the nature of how everything else works. If you own Kingdomino, the combinatory rules put forward a team-based game which is a nice touch that could help alleviate some of the issues in this section. It does require that you have both games. If you have Queendomino alone, it’s a game that lends itself less well to co-operative play. With this in mind, we’ll decrease our recommendation grade to a tentative recommendation for fluid intelligence. There doesn’t seem to be anything that specifically taxes memory beyond what Kingdomino expects, other than the minor benefits that would come from knowing the composition of the town tile stack. That grade sits as a strong recommendation. 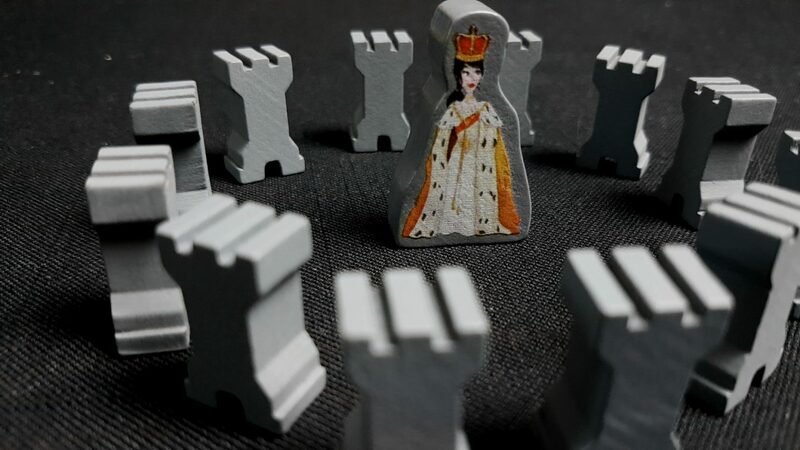 The only real new point of tension here is that ownership of the queen meeple changes as more towers are built, and the extra crown she provides for the largest territory can represent a big swing of points. In some cases, it might be an impact of double-digit points and that’s more than enough to rob someone of a victory when they thought it was secure. It’s not something that will entirely come out of nowhere because the options for towers are indicated in the market but it’s possible for the piece to be taken with no opportunity being available to get it back. Liberal use of the dragon could be employed to help support this kind of strategy too, and that would lead to a game that feels considerably more mean-spirited than Kingdomino. We will reduce our recommendation grade here a little, but not enough to knock it out of its current category of a recommendation. This is definitely a potential problem but it’s situational. The marketplace and knights add in some new physical difficulties here, but the game remains fully playable with verbalisation. Those with fine-grained motor control issues though might find the placement of knights within territories (and indeed, queen and towers) adds just enough extra frustration to make it an inferior experience to Kingdomino. We’ll still recommend it in this category, but we recommend Kingdomino slightly more strongly. Haha, I complained about the title in Kingdomino and now I have to do the same here for balance. The title is unnecessarily gendered, but it’s actually a little worse because the figures you control are still kings. All the nobles in the framing of the game are still men, even in a queendom. The queen is only a piece of which you regularly take possession and that… I dunno. It doesn’t feel very progressive. As with Kingdomino, the box art doesn’t prominently display any particular person but most of them are men save for the queen seemingly trapped on her balcony. It feels a bit cheeky in other words to title the game as Queendomino as a mirror to Kingdomino but still de-emphasise the role of the queen. The increased price of Queendomino (about a £10 difference) without a corresponding improvement in most of the game means that we need to reduce its grade in this category. It’s still a recommendation, but only just. Refer to the Kingdomino accessibility teardown for a full discussion of this. The accessibility profiles are identical, coming out as a strong recommendation. 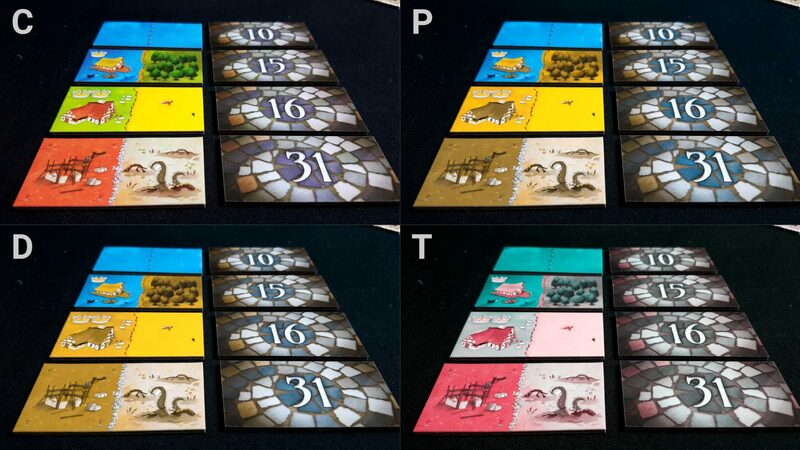 The main new issue introduced by Queendomino is that the icons used to indicate scoring bonuses for terrains are too small to really work well with colour blindness and visual impairment. As a result, we’d have to rescind our recommendations in both categories. Normally the game would still be playable with support but querying of the table would run the risk of incentivising the use of the dragon. That is going to have a corresponding impact on what game information a player should be willing to leak. I don’t often write teardowns where I can offload most of the work to another document, but when I do it’s like having a little holiday. I can get a review and a teardown out in about 60% of the time it would take otherwise. It feels like a bit of a cheat, but as a programmer I don’t feel comfortable in repetition when I can just use the equivalent of a function call. 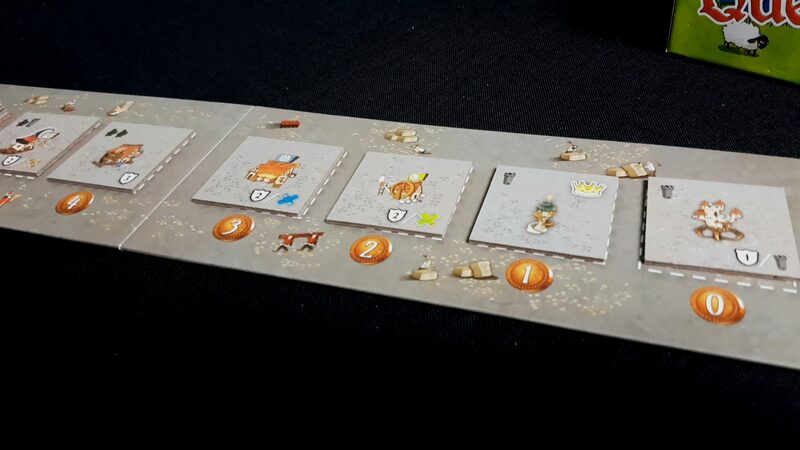 Queendomino unfortunately doesn’t do quite as well as Kingdomino and won’t be making its way onto our accessible games on a budget feature like it’s little and older brother. It wouldn’t anyway, falling foul of our pricing restriction, but the new complexity degrades the accessibility sufficiently in the visual and fluid intelligence categories that it’s no longer a candidate. Kingdomino remains an excellent option though. 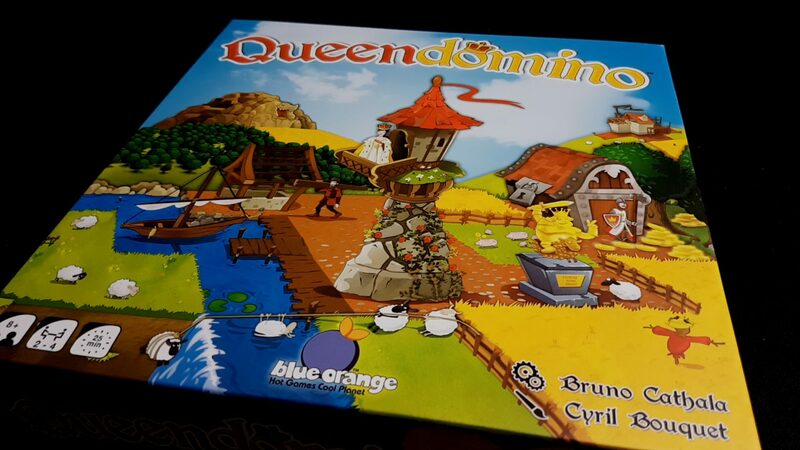 We liked Queendomino a little more than Kingdomino but not to the point we’d actually go out of our way to recommend it as a first choice. What it gains in the nuance of value judgement is lost in the relatively shallow and uninteresting economy around it. I won’t be keeping both games, but honestly I think I’m more likely to keep Kingdomino purely because of how intuitive it is for new players. Queendomino is a slightly better game, but slightly better doesn’t evict any of the other very excellent games I already own that occupy this complexity space.